This Foundation level course is the first course to be introduced by AXELOS in the new ITIL 4 certification scheme shown below. The Foundation course is a mandatory requirement for all other levels. This two-day course prepares you for the examination leading to the new Foundation Certificate In IT Service Management. The course enables you to understand a new way to look at IT Service Management through a Service Value System (SVS). ITIL 4 takes you through a more evolved view of a SVS which provides a holistic end-to-end picture of what it entails to contribute to business value, and also integrate concepts from models such as Lean IT, Agile and DevOps. Key concepts from Lean IT, Agile, DevOps, and Organizational Change Management, and why these are important to deliver business value. 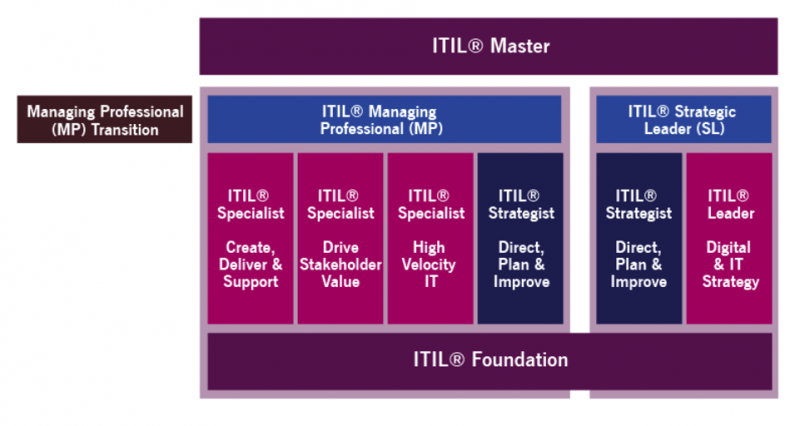 The ITIL 4 Foundation Certification Course is designed for all IT practitioners, those seeking a better understanding of IT Service Management education and those looking for a better understanding of how to provide business value; and also, for anyone who is looking to upgrade their ITIL v3 certification and knowledge. There are no prerequisites to attending the course. The exam is a 60-minute, 40 question, multiple-choice exam scheduled on the last day of the course. For online courses, the exam may also be scheduled and completed online. Delegates are required to score at least 65% to be awarded a pass.